Located in Cidade Jardim, an upmarket residential neighbourhood in central São Paulo, the Milan House is almost impossible to find, hidden as it is among dead ends, one-way streets and discreetly tasteful barriers that keep prying eyes at bay. Even the house’s modest driveway reveals little. Yet the residence is a spectacular find, a home that encapsulates the exuberant style of Brazilian modernism. Marcos Acayaba is highly revered by architects in São Paulo, and with good reason. His teaching and built projects have earned him great respect in the Brazilian architecture scene and he is a key protagonist of the Paulista School, a design movement that has influenced architecture in Brazil from the 1970s to the present day. His wife, Marlene, is no less influential. A writer and critic of contemporary Brazilian architecture, she has written several seminal books on the subject. The striking Milan House provides a fitting domestic backdrop for this formidable power couple. Marcos designed it for his sister-in-law in 1972, when he was just 28. Marlene, who was then still studying architecture at the University of São Paulo, contributed many detail designs. 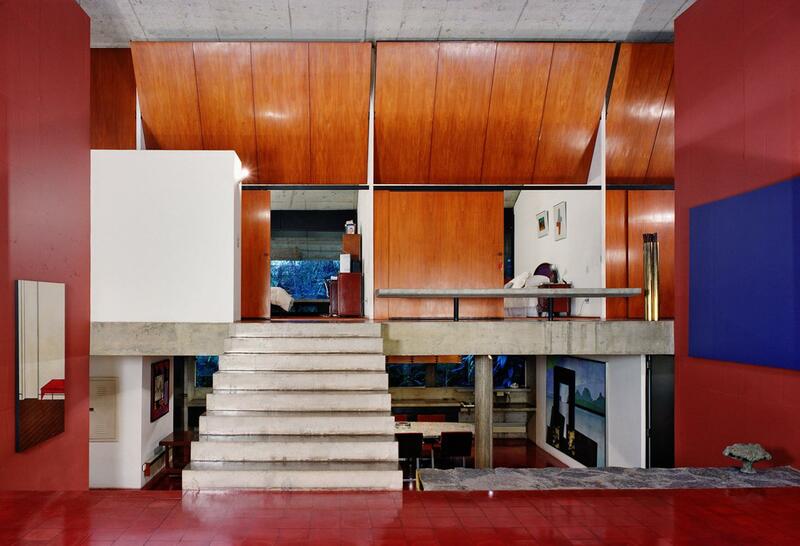 After the house’s completion in 1975, Marcos’ sister-in-law moved to Paris, so the couple moved out of their apartment in downtown São Paulo and have lived in the Milan House ever since. 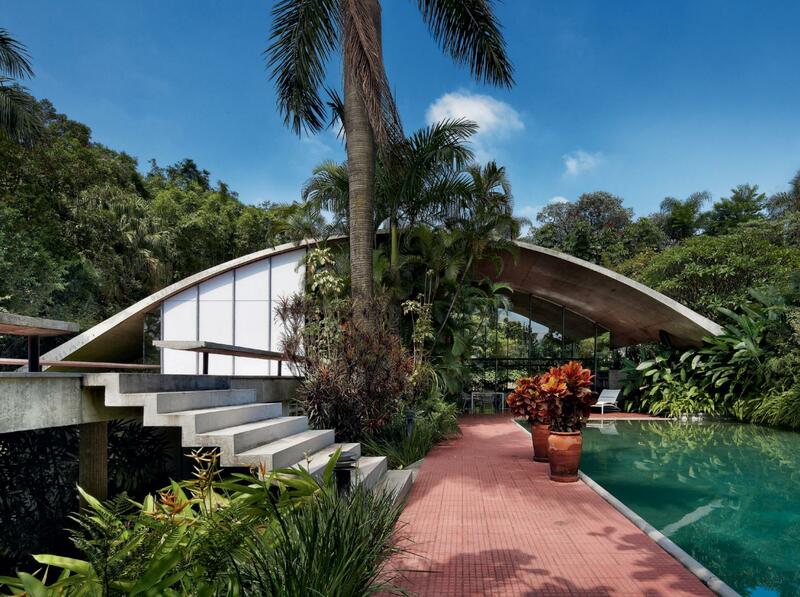 The design of the house is determined by a 17m-wide reinforced concrete roof, which forms a sweeping arch over the internal domestic spaces, while also framing views of the tropical gardens that surround the house. Within the arch, three half-level floors are arranged to accommodate the contours of the site. The oversized living space, set in one half of the shell, is the focus of the house. Glazed arches at each end open out onto gardens on one side and a 14m-long pool and gardens on the other. A fireplace, seating and bookshelves are built into the concrete side wall, while the room is furnished with the couple’s collection of modern and classic design. Throughout the house, art by friends and local artists is on display. In the lower level dining room – reached by a half flight of stairs leading down from the living room, and a corridor that runs past the service rooms to the car port – a painting by Luis Paulo Baravelli hangs beside a table and lighting that Marcos designed for the space. At no point in the house do you feel removed from nature. On the upper level, above the dining room, a long corridor opens onto four bedrooms and two bathrooms. The master and guest bedrooms all have views below the concrete shell into the lush gardens, while cantilevered doors at either end of the corridor open onto terraces, offering quick access to the gardens and swimming pool below. Very little has changed at the Milan House since it was built. New artworks have been purchased, a few lamps have been replaced, but overall, the house is a near perfect representation of the original designs. The Acayabas’ only major alteration, in the 1980s, was to remove an internal garden that failed to thrive without direct light and rain, and brought mosquitoes and other insects into the house. The main gardens, however, have become a tropical wonderland, tended and shaped over the years by Marlene. A wide variety of local plants vie to outgrow one another, creating the effect of the concrete shell having emerged naturally from the undergrowth. On the far side of the swimming pool, beneath a raised lawn, lies a concrete bunker. What appears to be a utilitarian subterranean den, tough enough to withstand a direct strike, is in fact Marcos’ studio, a space that has nurtured great ideas and projects. The shelves contain a fine selection of Brazilian and international architecture books, including a collection of Marlene’s many publications.